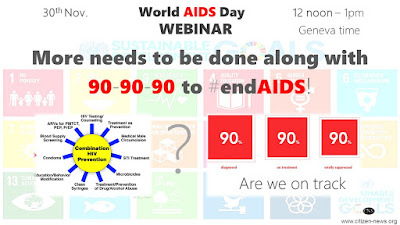 CNS (Citizen News Service): [World AIDS Day Webinar] More needs to be done alongwith 90-90-90 to #endAIDS! 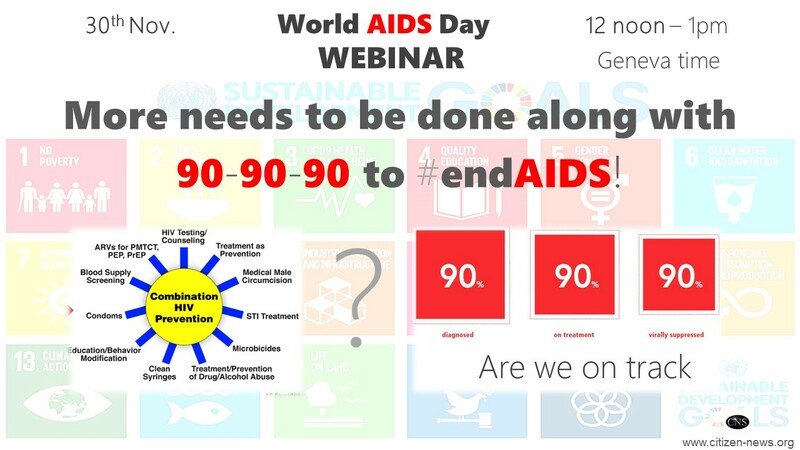 [World AIDS Day Webinar] More needs to be done alongwith 90-90-90 to #endAIDS! [Webinar recording] [Podcast] 193 governments have committed to end AIDS by 2030 (Sustainable Development Goals - SDGs), which aspires to eliminate transmission of HIV and healthy and productive normal lifespans for all people living with HIV (PLHIV). We must ensure that all PLHIVs know their status, all of them receive antiretroviral therapy (ART) and remain virally supressed (irresepective of where they reside), and no further transmission of HIV takes place, thereby making Undetectable = Untransmissible (U=U) a reality!